how do I submit a suspicious file to you? I have a file C:ProgramDataWRDataPKGSafarNEW_webfilter.safariextz that webroot says is clean, but everytime I move it, I find a new file has been created in the original location (above), which makes me suspicious whether this is a legit file or not. Is there a way I can upload my file to you so you can have a 2nd look and check it out more closely on your end?? If so, how do I do that? Do you have Safari for your browser? 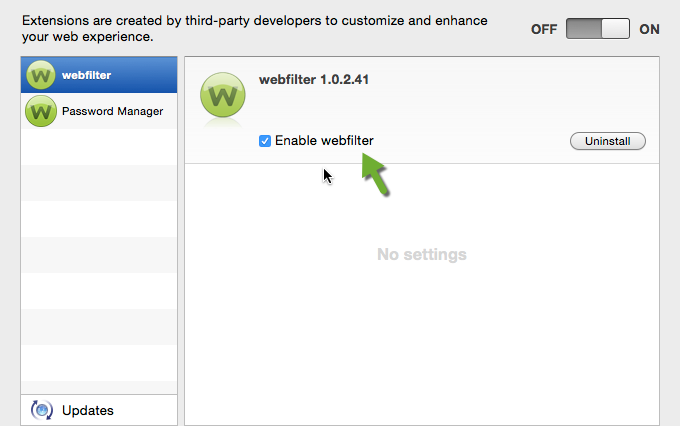 Because this is the Webroot Filter extansion for Safari as shown below. To the right you will see submit a file! Not sure why you would think that this file is suspicious since as far as I know this is the Webfilter for Webroot in Safari. And if you do not require it or want to use it then I would have thought that you would be able to disable it from within OSX. Perhaps @Ssherjj , our resident Max expert can advise on this line of action/approach?. Certainly I can assist here.. 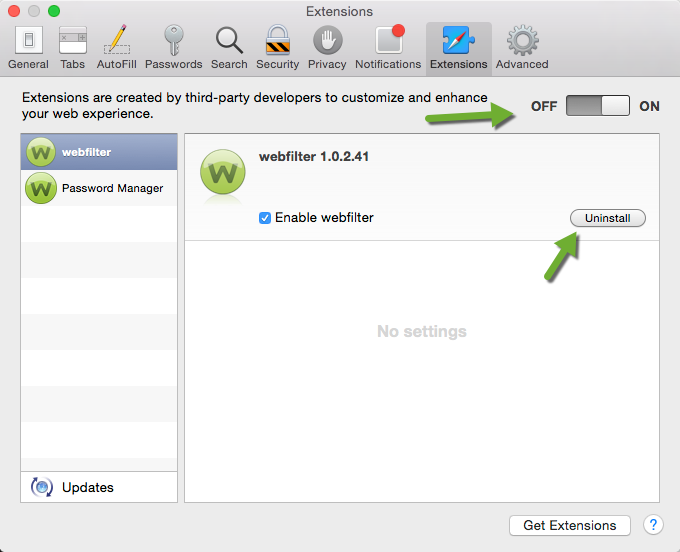 If you don't want to install the Webroot Extension you can shut off 3rd Party Extensions in the browser. I would go ahead and install that file (C:ProgramDataWRDataPKGSafarNEW_webfilter.safariextz ) and then if you want to disable it or uncheck enable webfilter. Just open Safari and in the left hand corner open up Safari Preferences and this is what you will find. Thank yo, Sherry, much appreicated...as always. I see no such interface. There is no "Submit a file" button, nor any of the other options shown. UPDATE: Well, I did manage to stumble upon the "Submit a file" button. Unfortunately, the suspicious file is an attactment in an email sent to me. I don't see any way to send that to Webroot. Avast makes it easy to submit a possible malware link by simply emailing it to their special virus email address. If the threat is an attachment, I'm able to forward it. That seems like a better way of dealing with the thing. EDITED: Are you using a Mac Computer? I'm using a PC. I did find the Submit button, but was unable to use it because the suspicious file came to me as an attachment in an email. Emails aren't scanned by Webroot, but as soon as you try to run a malicious attachment WSA would block the execution and protect your PC. Also if you would click on a link in an email the URL will be scanned against the cloud database. Now you can always Submit a Support Ticket which is free of charge and they should be able to help you. Thank you for the information. But I'm a little worried about taking a chance on opening it. What if the malware contained in the link was not on Webroots master list of malware? I received a different link attachment yesterday also and stupidly clicked on it. At the end of the day, when I was ready to turn my PC off, a huge pop-up ad was on my screen when all windows were closed. I suspect it was related to the attachment link I clicked on. It's always best to never open an attachment from an unknown address. So I wouldn't risk it either. Are you still getting popups? FWIW ~ Have you considered sending file as an attachment to VirusTotal. > have you looked at the raw message....if you do not recogize the sender, if you are not expecting email with attachment. I only got the one yesterday when I turned the PC off for the day. I am running both Avast and Webroot on my PC and have Avast scheduled to run a boot scan when I turn it off tonight. I know that, as good as Webroot is with it's small footprint and quick scans (which I appreciate), it can't do a boot scan. If malware from yesterday's email is ensconced on my machine, I hope the boot scan can root it out. Well as I mentioned you can always Submit that Support Ticket and they can check your system out. Thank for the information and link. There was a lot of information to digest on that VirusTotal page, but it appears to me that I would need to open the file first in order to send it. It doesn't look like I could simply forward the entire email I received (unopened attachment, included) to VirusTotal. And I have no intention of opening it. Thanks...but in order to do that, I would first have to click on the attachment to open it, wouldn't I? I don't want to do that. 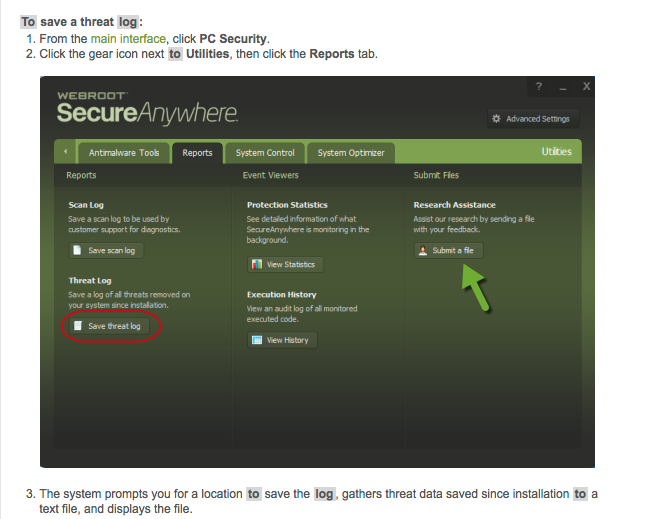 I think Webroot should create a special email address to receive suspicious emails containing suspicious attachments which users could then simply and safely forward to that address to be analyzed. . Right so the First rule is if you don't know who it's from and looks suspicious it's best just to delete it and be done with it! I hope Webroot is open to suggestions. Yes, I could just delete the stuff as it rolls in. But I'd prefer to make life harder for the perps, if possible.